Life is about many things, including chance. After I saw Moonrise Kingdom, which I honestly detested, I said to myself I would give another shot at Wes Anderson at the chance that Kingdom was maybe just a hiccup. It turns out I was right and I was glad I took another stab at Anderson as The Royal Tenenbaums is not only a great movie, but one of the best I've ever seen. 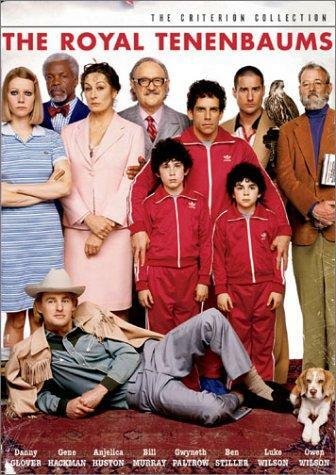 The Royal Tenenbaums follows the story of a man named Royal Tenenbaum (Gene Hackman) who is separated from his wife Ethel (Anjelica Huston) and three children who were former child prodigies: businessman Chas (Ben Stiller), playwright Margot (Gwyneth Paltrow), and tennis player Richie (Luke Wilson). Royal then claims that he is suffering from cancer which brings the whole family together and creates rather unusual complications. I'll start off by discussing the brilliant acting. I was amazed by watching just how all the actors became their characters. Gene Hackman disappears into the character of Royal, a man who has less admirable qualities yet a few tender ones that make him rather endearing. Gwyneth Paltrow stole every scene she was in as Margot, as she showcases her character's range of emotions through a more deadpan and monotonous voice. Luke Wilson is also brilliant as Richie, who is in my mind the heart and soul of the film as he is the film's moral center. All the other actors, including Ben Stiller, Anjelica Huston, Bill Murray, Owen Wilson, and Danny Glover, are are equally spectacular. Another thing I liked was just how relatable these characters are. Since this film deals with family dynamics, almost every character in this film might remind you of someone you know or someone in your own family. Margot is the rather invisible child who is very secretive. Richie is the concerned child who tries to keep the family together. Chas is the bitter child who is unforgiving of his father's dastardly deeds he committed in the past. Royal is the messed-up father trying to work his way back into the family's life and Ethel is the mother concerned about her children being educated. It is amazing that even though these characters are so offbeat, they are still very realistic and I applaud screenwriters Wes Anderson and Owen Wilson are creating a more original story about family dynamics. Speaking of Anderson, I loved the way he colorfully directed this film. Despite my problems with Moonrise Kingdom, I did love the way Anderson directed it and I especially loved the way he directed this. One of my favorite scenes is where Richie is talking with Royal about a public meltdown he had on television in a tennis match, and the scene cuts to the tennis match being shown on the television rather than just giving a traditional flashback. So, I applaud Wes Anderson as a director and after watching this film, I have much greater respect for him as a screenwriter. Plus, he and Owen Wilson manage to give the film funny moments but still create underlying drama that honestly touches on the heartstrings. The film was marketed as a comedy-drama, but I personally think it is the other way around. Overall, The Royal Tenenbaums is an artistic and offbeat drama-comedy that really hits close to home. I am more than happy I gave Wes Anderson another chance and checked out this masterful film that is the whole package: It has a wonderful and humanistic story, great performances, and brilliant direction. I'll be honest, this may not exactly be for everyone because Wes Anderson is one of those love-hate directors. But, I would still say give it a shot. You might find yourself as surprised as I was.